The smallest light in the Verilux range with an excellent price to make it well worth your consideration. This device is tiny in size which limits its features and usability and we found it a little too bulky to be considered for travel use. 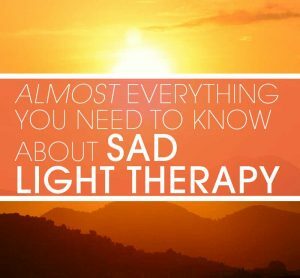 The 5000 Lux output mean longer treatment times are necessary to gain the same effectiveness as other models and thus we would consider this more of an aid than a proper treatment for those with severe SAD. It is well reviewed on Amazon.com with over 1000 reviews at an average rating of 4.3 stars although I suspect most of the reviews come from more casual users. We think it is better to spend a little more for a higher output model. 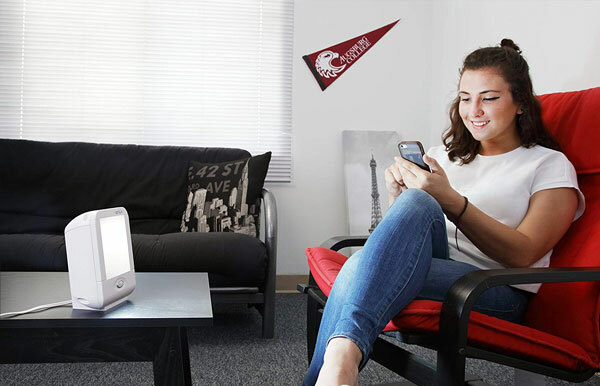 A Verilux Best Seller, the HappyLight Liberty energy lamp provides safe, comfortable natural spectrum light therapy in a compact solution. Compact, weighs only 1.5 lbs., perfect for small spaces and on-the-go portability. Durable, long lasting, and safety tested to the highest standards of compliance. 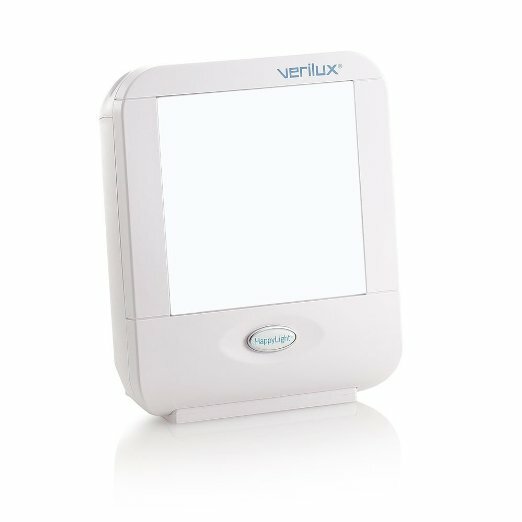 Backed by Verilux’s reputation for customer service, Verilux is the originator of the HappyLight. 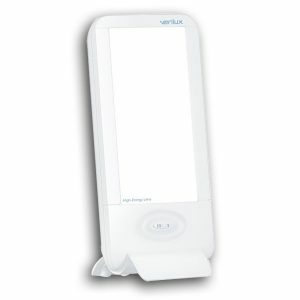 Verilux is a manufacturer based in Vermont and was originally founded in 1956. A prolific manufacturer of light therapy lights, they have many different options in their range. They look to provide environmentally friendly lighting solutions to improve their customers quality of life and well being. Although the companies promotional materials tout this lamp as being highly portable we found that the unit is small but not highly portable. The unit feels kind of chunky due to its 3-inch depth. It would be easily stored away when not in use but we wouldn’t recommend it for traveling. The light does look nice and is lightweight. The Verilux HappyLight Liberty stand is built in and has no way to change its position or angle. This is irritating as the light only shines straight ahead which means you need to place it on something in order to get it shining into your eyes. There is one switch on the unit, an on/off switch which is located on the back of the unit and is easily accessible. As with most of these lights, the manual is a small affair with just the basic information in it. The unit is powered via the mains and we found the power cord it comes with slightly too short. 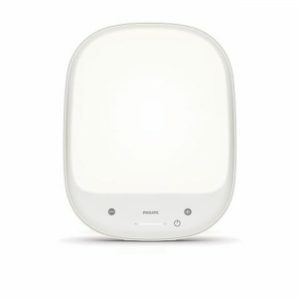 There is nothing to attach, you simply plug it in and press the on/off switch to turn on the HappyLight. With a claimed Lux output of 5000 at around 8 inches distance from your eyes this light is not on par with the most of the lights designed for treating SAD. 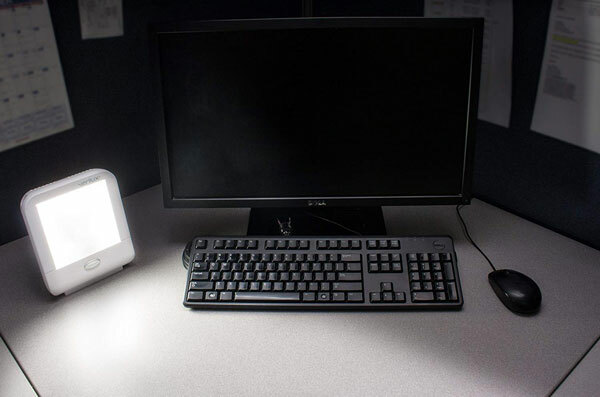 8 Inches is a very short distance to have a light from your face and you would need to spend a large amount of time under this lamp to meet doctors recommendations. We also note that the bulb needs approximately 5 minutes to achieve full brightness which is negative. The color of the light is a nice bright white and is comfortable to be in front. 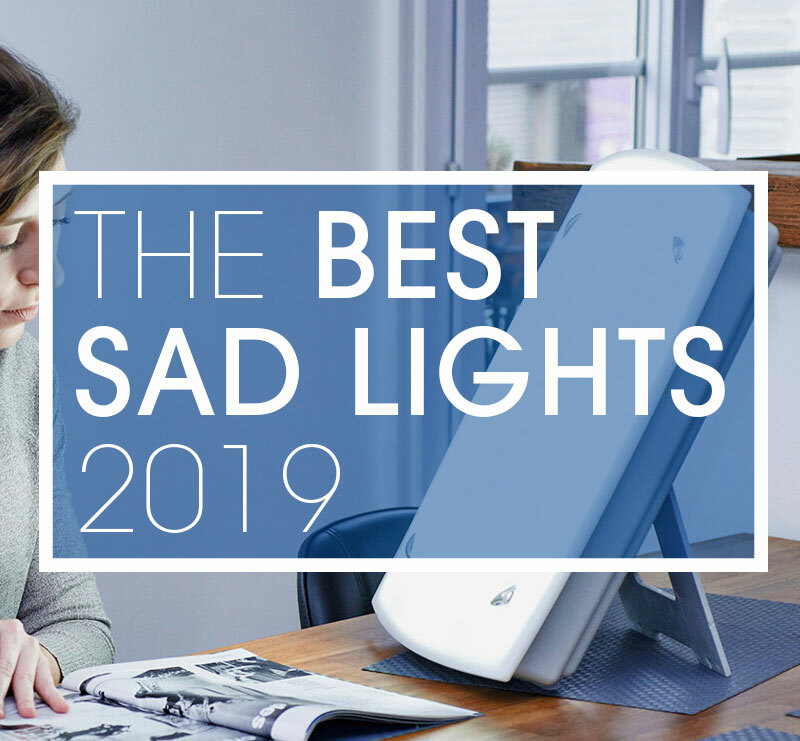 We wouldn’t recommend this for people looking for a light to treat SAD however for general use, perhaps as a reading light, we think this is an excellent choice. After extended use, we noticed that the plastic was getting warm. Although we don’t think this is a problem, if you plan to use it and then carry it with you this should be noted. No extra features on this basic model. Just an on/off switch on the back of the unit. A lack of a timer is frustrating and as mentioned earlier the stand doesn’t have any form of adjustment. This cost of this light is very good at from $134.95 including shipping. This puts it right at the bottom end of the market and is a price that will rarely be matched, however, its lack of features and maximum of 5,000 Lux output means that we feel it is priced about right and consider it good value for money.